Just a thought of some cool and refreshing dessert in scorching summer heat invigorates freshness and renders one with much required relief. So why just think! What is the wait for?? A quick easy recipe of some luscious nutty, creamy Kesar Pista Kulfi, which will make not only your little ones but elders drool as well. 1. Boil 1/2 ltr of full cream milk and add 3-4 strands of kesar and crushed cardamom pods. 2. Simmer the gas stove and now add some milkmaid for sweetness and to thicken the mixture. 3. Meanwhile roughly crush the almonds and pistas in a blender and add to the simmering milk. 4. Once the milk has reduced 3/4th quantity, switch off the flame and let it cool to room temperature and add rose water. 5. 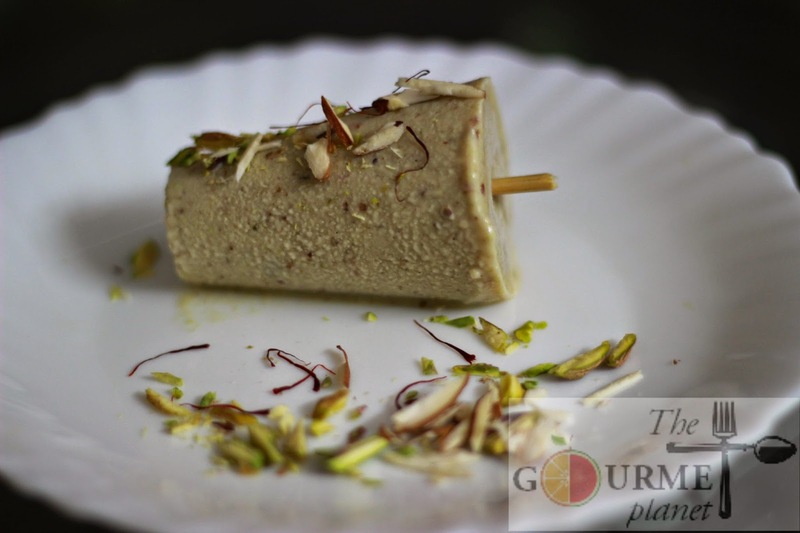 Transfer to the kulfi moulds and freeze for 5-6 hours. NOTE: You can add the sticks to the kulfi once it has stayed in the fridge for half an hour and is half frozen. 6. Once set, take the kulfi mould out and rub it thoroughly between your palms to loosen from the edges.